The bloodworm is an imitation of the larval stage of the Chironomid midge or buzzer. Bloodworm spend the majority of their time living in a silty tube. When disturbed they move their bodies from side to side..
Best fished either on a floating line and long leader or sinking/intermediate line near the bottom, using a slow figure of eight retrieve. 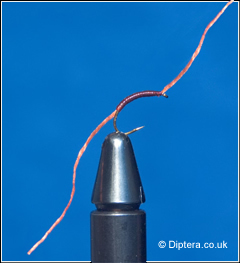 Wind the thread down the hookshank to a position opposite the barb catching in a good length of flexifloss as you go. (Make sure that enough length is left for the tail). Wind the thread back up towards the eye, making sure the body is even. Wind the flexifloss back up towards the eye, creating a nice even body. Secure the flexifloss at the eye, whip finish. Trim the flexifloss ends to the correct length. ( I find 4 times the hook shank length at either end is more than enough, but its up to you).